Welcome to our drawing tutorial on how to draw a fairy. This little fairy was inspired by Tinkerbell from Peter Pan, one of the most well-known fairies of all time. Fairies are small magical human-like beings who are usually invisible, with the exception of some people who have the gift to see them. Start by drawing the basic shapes that serve as a guide. Draw a circle for the hips and lower body. Then draw an oval shape for the torso and then another oval standing upright for the head. Now draw a curved line from the top of the hips circle throught the middle of the torso circle, then stopping at the bottom of the top oval shape, which will be the head. Now draw one line from the bottom hips circle out at 45 degrees then back and down at 45 degrees. This is the leg bent at the knee. Now draw another line for the other leg curving down. See image as a guide. Using the guide shapes, draw the fairy’s dress with the bottom of it having sharp points to show it’s ragged. Then draw the head shape, hair and neck using the top oval shape as a guide. See image on the left as a guide. Now add in the ear and hair line. Now draw in the line for the pointy nose. Draw the first arm from the top of the chest oval shape. The arm should extend out and down. Finally, draw the leg bending at the knee. See image. It’s time to draw in the eyes, with two leaf shapes for both eyes. Now draw in the other arm that is bending upwards, to help show she’s balancing while flying. Now draw in the other leg line that points straight down. Let’s add the wings! 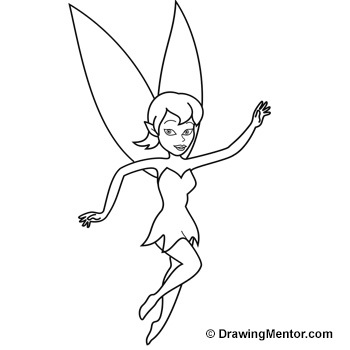 Draw two big pointy leaf shapes behind the fairy for the wings pointing up as she flies. now add two circles inside the eye shapes for her pupils. Add her eyebrows. Finally we’ll add her mouth. We’re now complete! You now add some details such as stars around her, even add a fairy dust trail behind her as she flies! If you enjoy learning how to draw a fairy, you may also like these!